For perspective, the bowl on the right is a LARGE salad bowl. 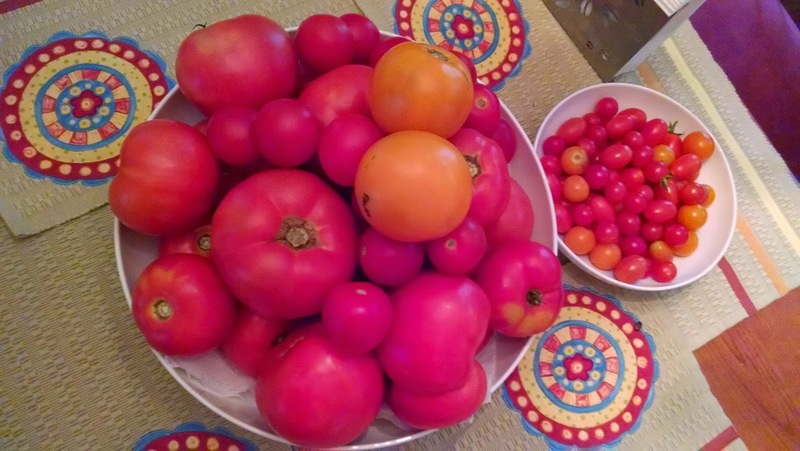 This week's farm share included lots of tomatoes. LOTS. A quart of cherry tomatoes, some Jolly tomatoes, and many, many larger ones. I already have 5 gallons of tomatoes frozen to make tomato sauce and, I think, that's enough. I thought maybe the Jollys would be good if they were canned whole and then I remember that I like using canned diced tomatoes for some of my stews and figured I could use the rest for that. After skinning the tomatoes by immersing them in boiling water, I set aside the Jollys. They fit into one quart jar. The rest of the tomatoes were seeded and diced and they filled 3 quarts and 1 pint jar. Each jar got some lemon juice and salt and then they were processed for 45 minutes in the boiling water canner. I was worried that the lemon juice wouldn't get distributed evenly but I shouldn't have, the tomatoes shrink a bit and so all the liquid circulated nicely.